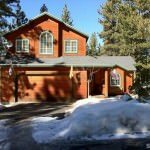 1903 Talbot Pl South Lake Tahoe CA offered at $528,000Bright and open floor plan located in a wonderful neighborhood makes this the perfect Tahoe home. Beautiful stone fireplace including updated gas insert in living room with vaulted ceilings. Skylights in the roomy, well designed kitchen with newer cooktop and wall unit oven/micro combo on lower lever for easy outdoor access. Custom plantation shutters on windows and newer hot tub on the back deck. Spacious master suite. Large...Continue Reading!